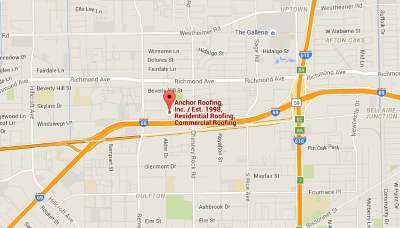 Residential Roofing, Anchor Roofing, Inc. has been serving the Greater Houston area since the 90′s. We have over 30 years’ experience in contracting. Individual property owners and investors are eligible for competitive free estimates to design solutions by us. Anchor Roofing offers long-term warranties on total residential roofing systems or coating applications. Our membership with BBB, NRCA (National Roofing Contractors Association), and RCAT (Roofing Contractors Association of Texas) are the assurance for the quality of our craftsmanship. We possess a license from the City of Houston (license number: 0126219) and have an insurance with workman’s compensation coverage to best protect us and our client. Asphalt Composition shingles and Wood Shake are the most common roofing material in residential roofing and other “Steep and Slope Applications” worldwide. Composition Shingles are an amalgamation of carrier sheets of organic or fiberglass. These have a coat of asphalt and granules of a wide array of colors. Some asphalt shingles look like wood shingles too. Many shingle manufacturers have met Energy Star Requirements with certain product lines and are eligible for tax credits. Wood shingles comprise of cedar wood. In climates less humid, wood shingles get treatment with fire with a retardant. Split wood shakes are aesthetically pleasing and long-lasting. Shakes, due to their rough look, are a preference in certain architecture concepts. They take more time to install than typical shingle applications. Wood Shake shingles enhance the aesthetics. Therefore, for decorative purposes, the installation happens with another roof underneath it. All across the world, many applications are utilizing slate roofs. Hence, this material ages very well in residential roofing applications. However, specialization of the slate application is very high, with fewer contractors specializing in this type of material installation. Meanwhile, in many cases, there are flat roofs on residential roofing structures. Therefore, please refer to the Low Slope Commercial, Industrial and Institutional page for further information about residential roofing systems. Residential Roofing Coating Applications: Often the application of a coating system is a preference as a low cost alternative to a complete re-roof. Coating technology has increased substantially over the last decade and due to these advancements and our certified applicator credentials. And, we can not only waterproof your roof we can also provide up to a 20-year total system warranty. Contact us for roof repair Houston for reconstruction of your roof.